There are two kinds of West Nusa Tenggara’s landscape. The first is the Lombok island with fairly straight coastline and the second is the Sumbawa island with squiggly coastlines. 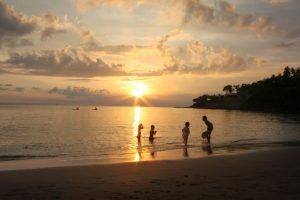 If you wonder what you can do in Lombok Island, you can have a look at Things To Do in East Lombok and Things To Do in West Lombok. Both Lombok and Sumbawa islands are very rich of tourism spot and traditional culture. The beautiful panorama from the mountains, beaches, forests, and the savanas have attracted many people to come to West Nusa Tenggara. These are Things To Do in West Nusa Tenggara for you to know. You will never get enough of having trip to West Nusa Tenggara and will always want to come back again. 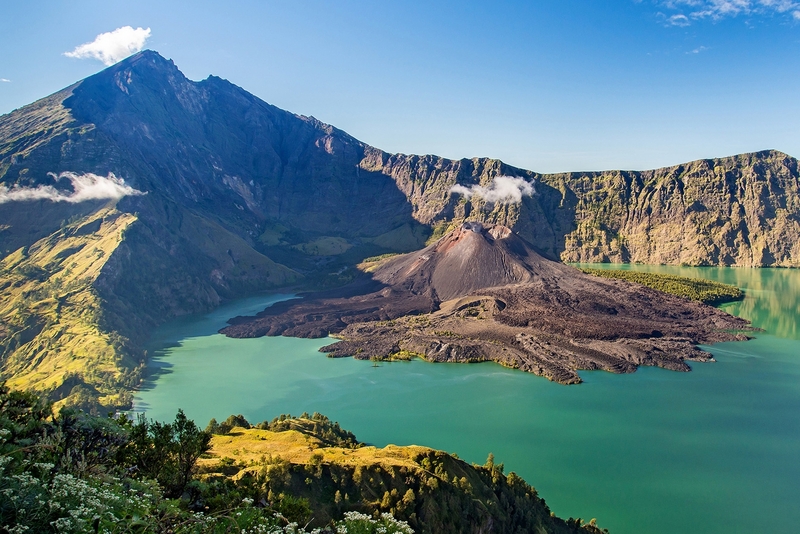 If you love to climb, then climbing Mount Rinjani is one of the things to do in West Nusa Tenggara. This second-highest mount in Indonesia is located in Lombok Island. Hiking to Mt. Rinjani gives such beauty in every step since the very beginning of the journey. The hikers will meet savana, tropical forests, and the hills that can blow anyone’s mind. This trip may be extreme and challenging but the beauty is really worth it. So, don’t hesitate to hit the top of Rinjani and explore Things to Do in Mount Rinjani Lombok. Batu Bolong Temple takes place at the top of a coastal arch. 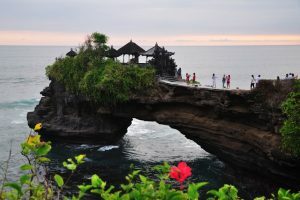 Since the rock formation has a hollow in the middle, it’s called Batu Bolong in bahasa. This temple may remind you about Pura Ulun Danu Bratan in Bedugul, Bali that you can take a look more at Things to Do in Bedugul Bali. There are few legends behind that small temple. Some people say that there used to be a woman fed for sharks and the others say there were many women jumped from this cliff because they were brokenhearted. From this temple, people can see Mt. Agung in Bali. When the sun goes down, the view is getting more beautiful. West Nusa Tenggara has many gorgeus beaches that you will never have enough of. Those are beaches where you can enjoy the sunsets, sunbathing, snorkeling, drinking coconut water, and any other ocean things to do in West Nusa Tenggara. One of the best beaches that you need to visit are Senggigi beach. 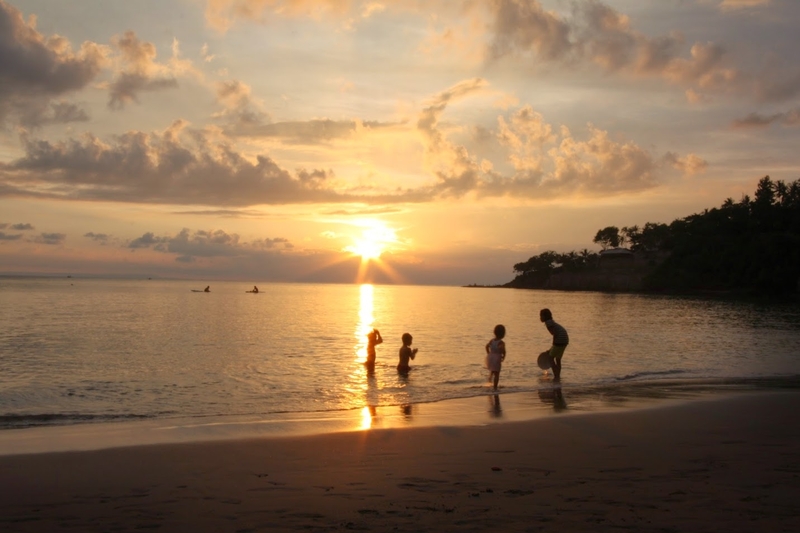 You won’t regret visiting Senggigi beach as told in Things to Do in Senggigi Beach Lombok. The clear water, many species of fish, colorful corals and the mild currents make the snorkeling feels so pleasant. Waterfalls always steal the hearts of travelers. In West Nusa Tenggara, you will find many wonderful waterfalls that you can enjoy the water and take pictures. 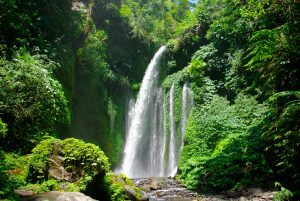 There are many waterfalls you can take a trip to such as Sendang Gile waterfalls in Senaru, Benang Stokal in Praya, Matajitu in Pulau Moyo, Dewi Selendang in Lombok and many others. Sendang Gile waterfalls is located in Rinjani’s foothill. The view and the water will never make you regret the long trip. 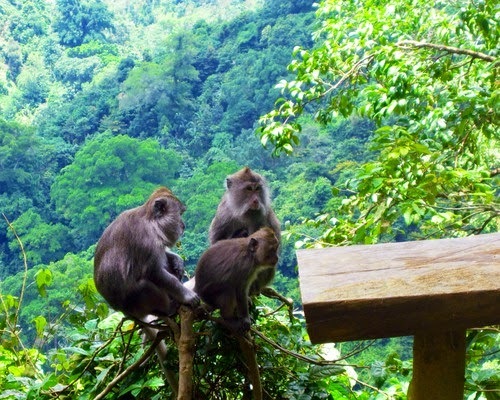 The next thing to do in West Nusa Tenggara is watching monkeys at Pusuk forest. This forest is located at Rinjani’s hillside where we can see green landscape, feel the fresh air and also meet monkeys. Watching monkeys in this forest is relatively easy since the monkeys are somewhere at the edge of the street. The tourist can watch those monkeys, take pictures and also feed them. Mantar Hill takes place in one of the villages in Poto Tano Sub-district, West Sumbawa Regency, Wes Nusa Tenggara which is located just above the ridge at an altitude of 630 meters above sea level. When you lay your eyes around, all you can see is the beauty of stunning natural panorama and you will feel the fresh cold mountain air. 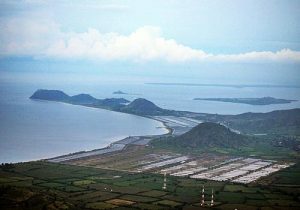 If you look to the west, you will see the island cluster and the beautiful view with the background of the island of Lombok and the Alas Strait. On the other side from the top of Bukit Mantar’s back, there is a long island that stretches across the sea of Alas Strait waters. In Kabupaten Dompu, West Nusa Tenggara, there are exactly 14 bunkers left by the Japanese. These bunkers are in the form of cave that were sculpted in rocks layer around Hu’u beach. The bunkers are located within the locally owned garden. The bunkers are made of stone and cement which condition has been much damaged, there are even some alleys that have been buried by landslides caused by coastal abrasion. However, this place can be another option to visit due to its uniqueness. 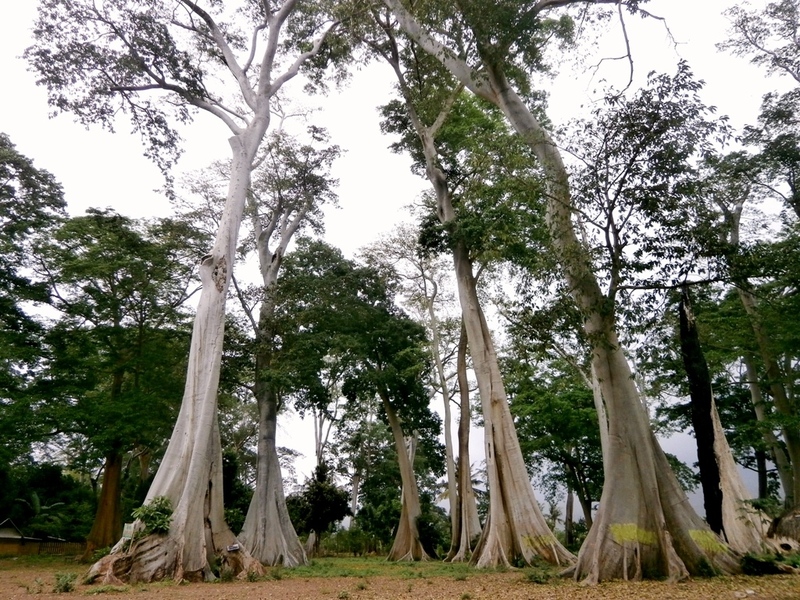 There is something interesting in East Lombok where you can find the giant trees which have lived for about 350 years. These trees are located Dusun Permatan, Desa Gunung Malang, Kecamatan Pringgabaya which is a northern highroad of Lombok Island. There are at least 40 trees in the forest that belongs to 4 persons. The trees are so tall and the trunks are so wide. It needs 3-4 persons’ arms to completely circle the diameter. Another thing to do in West Nusa Tenggara that you shouldn’t miss is visiting Taman Narmada in Lombok Island. This place is a historical tourism spot that will show you what kind of buildings that the king and his family used to live. In that place, there was also annual ceremony to celebrate and thank God for the crops. There is also a swimming pool that is believed to. Indeed, there are many blessed things to do in West Nusa Tenggara Indonesia. Traveling to West Nusa Tenggara is still not complete if you don’t make time to take a look at the tradition and the culture of the local ethnicities. Sasak is an original ethnicity of Lombok Island. The people of Sasak ethnic still maintain the authenticity of the traditional culture. One of the famous villages to visit is Sade village. 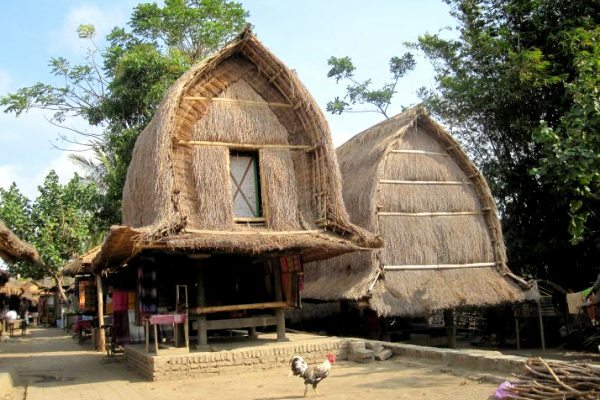 In this village, there are some traditional building with unique design. Meanwhile, there are many more heavenly Places To Visit in Indonesia. So, let’s have a great holiday in Indonesia. 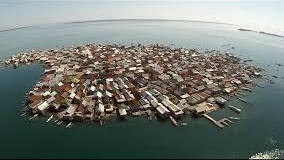 Bungin Island is most crowded island in the world. On this island there is almost no empty land since the whole land is full of people’s residence. The high density population makes Bungin Island has no coastline. 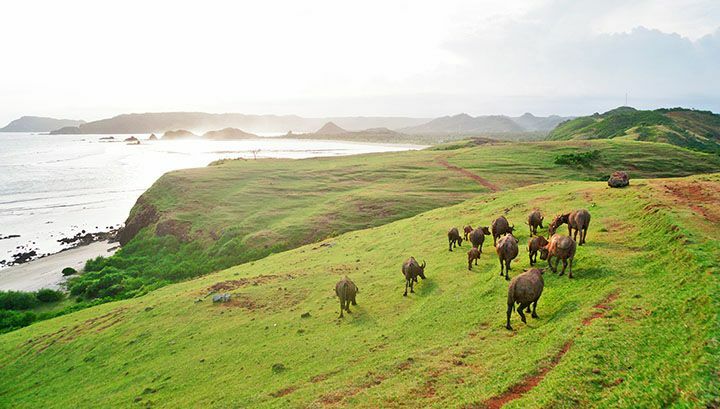 The next thing to do in West Nusa Tenggara is visiting Merese Hill in Tanjung Aan beach, Lombok. Merese hill is a green grassland above Tanjung Aan beach which has white sands and clear water. In this hill, you can see the beach view and the coral reefs below cause the water is very clear. Standing firmly in the middle of the Sumbawa Besar City, West Nusa Tenggara, Istana Dalam loka is a historical witness that shows the glory of the Sumbawa Sultanate in its era. Istana Tua Dalam Loka looks very luxury with a stilt house which is 904 m square in area. Coming to West Nusa Tenggara, especially Lombok Island is still not enough if you hadn’t visited tenun tourism village such as Sukarara village, Sade village, and Banyumule village. In these villages, you can get to know more about how to make tenun and try yourself how is it like to weave a tenun fabric. 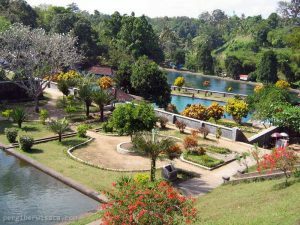 The next best thing to do in West Nusa Tenggara is coming to Lake Segara Anak. Lake Segara Anak is a crater lake in Mount Rinjani. This lake has the blue color of the sea. There is also a hot spring in this lake where you can have a warm water bath. In Kota Tua Ampenan, there are many old buidings that are quite interesting to take pictures of. In this place, people will find the classic buildings that were built in 1800s. These art deco-styled buildings were used to be one of the downtown in Lombok that was developed by Netherland to compete with Bali’s kingdom. The Gili Islands is one of the most popular tourist destinations in West Nusa Tenggara. Gili simply means “small island” in Sasak. Located just off the northwest tip of Lombok, Indonesia, the islands are very relaxed and laid-back. There are many little beachside cafes, restaurants and bars serving a variety of tastes in local and international cuisine. Sembalun district has 6 villages. Sembalun village is one of the village that is on the foothill of Mount Rinjani. It is one of those ways to reach Mount Rinjani. The view in this village is so breathtaking since you will see green forest and the cliffs. Makam Batu Layar is one of the religious tourism spot that can be a choice. The location of this place is in West Lombok which is about 9 km to the north of the city of Mataram. 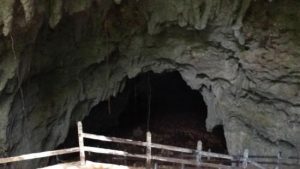 Those are Things To Do in West Nusa Tenggara that will make you curious about this amazing place. Just make your time to visit these places and you will never regret it. If you wonder what to do in Mataram, Lombok Island, West Nusa Tenggara, go check Things to Do in Mataram Lombok.